On Monday, the Fundação Bienal do Mercosul announced my appointment as the chief curator of the 9th Mercosul Biennial, scheduled to open on September 13, 2013 in Porto Alegre, Brazil. A press release of this announcement, and, perhaps most importantly, a curatorial statement for the biennial, can be found here. All the while, I will continue to work as curator of contemporary art of the Colección Patricia Phelps de Cisneros. Seems like I should also begin writing more regularly here, posting research-in-progress. To join me in the adventure of organizing the biennial, I’ve brought together a team of curators and educators that I highly respect. The team includes Raimundas Malašauskas, a curator who I’ve collaborated on several projects before, as well as the educator Mônica Hoff and the curator Bernardo de Souza, both based in Porto Alegre. They will be closely involved in the curatorial research, including the artist selection, commission of new work, and the conceptualization of the biennial’s exhibitions and educational programming. In addition, an interesting group of curators will be engaged in the research towards the biennial through a curatorial fellowship program. I’ve called this program the “Cloud Fellows,” as they will help determine the shape, the place and the experience of information in the biennial. They will certainly also influence the artist’s selection –are already doing so– and project development in general. These are the fellows: Sarah Demeuse, based in New York City, and co-founder of Rivet; Daniela Pérez, based in Mexico City, and co-founder of De Sitio; Julia Rebouças, based in Belo Horizonte, and member of the curatorial team of Inhotim; and, Dominic Willsdon, based in San Francisco, and the Leanne and George Roberts Curator of Education and Public Programs at SFMoMA. 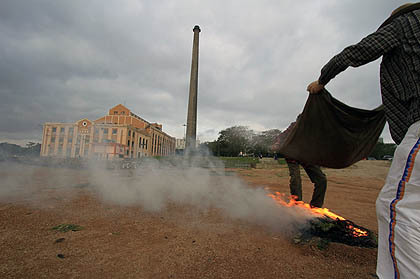 The appointment of the curatorial team for the 9th Mercosul Biennial was publicly announced through a smoke signal on Monday, August 13, 2012 in Porto Alegre, Brazil. The image above is of this event; it was taken by Cristiano Sant Anna (indicefoto.com).